Please note the change of date and address of the Irish village. First hundred online applicants get free tshirt on race day.T-shirts will be available for purchase the day of the race. 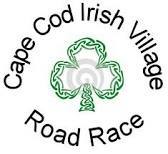 Irish Village is offering special deals to runners. In consideration of accepting your entry, I the undersigned, intended to be legally bound, hereby, for myself, my heirs, and administrators, waive and release all rights and claims for damages I may have against the Cape Cod Irish Village of Yarmouth, and any and all sponsors, charitable beneficiaries, and their representatives, successors, and assigns for injuries suffered by me in said event, even if such injuries result from negligence, fault or carelessness of the Cape Cod road race or any of the other named groups or persons. I attest and verify that I will participate in this event as a foot r I am physically fit and have sufficiently trained for completion of this event and my physical condition has been verifie Medical Doctor. Further, I hereby grant full permission to any and all foregoing to use any photographs, videotapes, D pictures, recording or any other record of this event for any legitimate purpose.